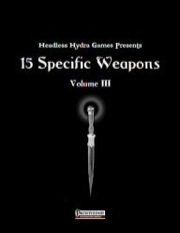 15 SPECIFIC WEAPONS, VOLUME III—A Magical Weapons supplement! Magical weapons are a necessity of most roleplaying games, yet the core rulebook presents so few of them. Magical weapons are loved by players and game masters alike, yet there is almost none to choose from. There is nothing like a memorable magical weapon to help define a character throughout a campaign, just think about your favorite fictional heroes of fantasy and the weapons that they carry! ... yes, there are 17 weapons and not 15 as announced! In this pdf, you'll also find the bloodhunter special ability and the stats for the dogslicer, ogre hook, dwarven maulaxe and bladed scarf. Pdf also includes bookmarks. Written by Ken Burnside, K. Axel Carlsson, Mark Gedak, Will McCardell and Jonathan Palmer. Artwork by Mike Burns. 4.5 Stars - excellent selection of weapons for less than a buck! This pdf is 11 pages long, 1 page front cover, 1 page editorial, 2/3 of a page SRD, leaving 8 1/3 pages of content for 15 new specific magic items, so let's check out what Headless Hydra Games has to offer for less than a buck! After a cool discussion on the nature of magic weapons, we delve into the items and in this installment, we get weapons that are a bit more off the beaten track - we e.g. get the Bang Cutter, a magic dogslicer that ignites those nasty horses and dogs. The Bolt of minor inconvenience is a neat piece of ammunition as well: It teleports hit enemies 1d100 ft. in a random direction when the target fails a will save. The other 2 bolts of inconvenience are more powerful versions - cool ideas! The Detonating pilum is also a cool throwing weapon, dealing some neat explosion damage and we get firestorm shurikens and even a magic ogre hook. Another cool item is the librarian's rejoinder, a bloodletting keen kukri (bloodletting being a new special weapon quality introduced in this pdf) that can transcribe the last text the victim read one hour before being killed by the weapon in infernal - very cool idea. Add to that an enchanted stake and an enchanted bladed scarf that doubles as a hat of disguise and can cover the wielder's face in flames. Editing and formatting are top-notch, I didn't notice any glitches. Layout adheres to a beautiful 2-column standard and 6 of the weapons get their own artworks. The pdf comes with extensive bookmarks. The new magic items are cool and using some more exotic base types (and reprinting their stats) is a good idea and some of their abilities rock. While not every item herein is a full-blown winner, I enjoyed them enough to consider this installment a worthwhile investment - at less than a buck, you get a neat selection of magic items that goes a bit beyond what you'd expect. Seeing that I don't have anything to complain and taking the low price into account, I'll settle for a final verdict of 4.5 stars, rounded up to 5. Well done! 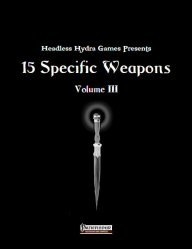 Volume 3 in the series of 15 Specific Weapons from Headless Hydra Games follows the dual column format, and has a visual style to the pages that caught my eye instantly. The colors and artwork of the framework on the pages kept drawing my eye back to study and find new things, very nice touch. We are also given illustrations of six of the weapons, with a level of decent quality. Of the 11 pages this PDF weighs in at, 5 1/3 actually contain the new magical weapons. The standards of cover, product Identity, OGL and such eat up several pages, and we start with an intro and opening from Ken Burnside that flesh out the rest of the PDF. It is within that opening that we find the argument, and discussion, towards the concept that magical items should exist for a reason other than to fill the shelves of our local Wal-Mart in whatever town your hero's are wandering into. It is a well defended viewpoint, with a sound argument. The article goes into depth looking at how magical weapons have been represented to us throughout our literature and myths, reminding that we all know of a certain hobbit's swords penchant for glowing, but how many of us know what + it had to hit? What an item does can be just as important, if not more important, than what bonuses it may get, as that's where the story potential lies. Arcanaphage: An interesting weapon, the arcanaphage is a swordbreaker dagger with the ability to break the connection between magical items and their wielder/wearer, as well as grant temporary HP's each time it does. Bang Cutter: An enchanted Dogslicer, adding the goblin love of fire to their hatred of dogs and horses gives us this specialized weapon of goblin destruction. Bolt of Minor Inconvenience: A bolt shaped like a stylized key, with a penchant for teleporting struck targets a certain distance randomly. Bolt of Inconvenience: Yep, you guessed it, slightly stronger bolt, lot more possible range for that teleport. Bolt of Major Inconvenience: And to round it out, we have an even stronger bolt, and the potential to be shipped off plane. Death's Finger: A rather wicked sickle crafted with a human bone handle, this one comes with bonuses to the critical confirmation roll. Detonating Pilum: Upon striking a target, the detonating pilum explodes in a wave of fire dealing damage to all within a certain range. I can only assume the wielder is excluded from said damage as it does not specifically state. Firestorm Shuriken: Upon a successful confirmed critical hit, these shurikens unleash a widened fireball (as per the spell). Grappler's Gauntlets: A pair of fingerless gloves designed to work in tandem to allow for unarmed combat maneuvers with increasing boosts. Gul's Ogre Hook: An adamantine ogre hook, this vicious weapon drips blood when wielded in combat. And for a limited amount of times a day, will add insult to injury with a pain strike spell to top off a critical hit. The Librarian's Rejoinder: A kukri, carved with miniscule runes, this blade benefits from a new ability (Bloodhunter), which is detailed within this product. When the blade is used to kill, the runes transform into an infernal translation of the last thing the target read, up to an hour ago. The possibilities here are so immense, there's literally an entire campaign of ideas waiting to spring from this weapon alone. Lodestone Flail: An interesting concept, a flail, with a lodestone for a head, offering up bonuses towards disarm attempts against metallic weapons and shields. Purification Stake: Wooden stake, on steroids. Equipped with blessings from a priestess of the Goddess of Death, this wooden stake packs a few magical tricks up it's sleeve. Scarf of Lethal Beguilement: This operates by hiding the wearer's identity behind a veil of flame, giving bonuses to Intimidate checks during the initial round of activation. Shadowbiter: Punching dagger with a handle formed of a troll bone. When used to kill shadows, a piece of the slain shadow is temporarily transferred to the wielder, giving a bonus to concealment. Stonebreaker: Dwarven maulaxes designed to overcome elemental foes, these could do some serious damage. Vengeance Spear: Also benefiting from the new ability presented in this product, the vengeance spear is a bane weapon, with it's grip wrapped in leather's crafted from the skin of the race to which the weapon 's bane applies to. BloodHunter: after striking a target the weapon becomes attuned to that foe's blood. As long as you stay within a certain distance, the weapon reacts to their presence. Additionally, cover has less chance of success against an attuned weapon. Final thoughts....The title promised 15 weapons, I got 14 straight up, and 1 with 3 variations. I also got a new ability, an insightful article as to why the history and reason behind a magical item matters, a handful of hooks and ideas from the histories of several of the weapons, and a handful of decent illustrations. And I got all of this for an insanely cheap price. I found not one grammatical error worth noting, nor any formatting errors. All in all, if you haven't picked up a Headless Hydra product yet, you need to, period. A solid 5 star rating, well done folks. Now available! I hope you enjoy. Thanks, with this product we are using a new artist - Mike Burns! I think he does a pretty good job with the weapons, but his style is a little different from the artist who did the other two products. The weapon on the cover is the Purification Stake... obviously. Just updated this product! I caught a couple of typos, nothing too important, but still. I'll be going over vol 1 and 2 the next couple of days and try to update those as well. If you have any comments for these that you wish me to consider (maybe balancing issues etc. ), please drop me a note at storyguide.axel@gmail.com. grabbed, devoured, reviewed. Fantastic selection of items, very nice. Reviewed here, on DTRPg and sent to GMS magazine. Great work! Cheers! Thanks KTF and EndZ, for two awesome reviews! I am glad that you liked them and didn't find many (if any) mistakes. Here is a question for you: Would it make sense to post the stats for all the various weapons in each product? For easy use and reference. It wouldn't add anything to the price. Yep, I think so. It would make the product more usable and prevent one instance of potential page-flipping. By the: Nice array of reviews in the last couple of days! Yeah, I've noticed that as well... I've already marked at least a couple of products for buying based on new reviews. I forgot just how awesome the Librarian's rejoiner was! Very much so, Having all the data at my fingertips would kick this product up that notch I did not realize it was missing, lol.